Time after time, retail software systems as a whole and retail software in India have gone continuous improvement, and when you look into it, retail shop software has not only replaced cash registers and old checkout systems, they have become a lot more than just a POS machine. POS Software developers came up with a fully integrated business management solution in a single system, which changed the whole perspective of retailing systems, which are now being blended into smartphones and IPad. Sales Figures : The key to successful retailing starts with learning from what you have done. Sales report consist of vending figures which can be seen for different ranges and slots, which will help you compare the sales success during various hours of the day or a week or a month. This report will lead you to some conclusions which can be optimized to improve your scale of profit. This can also help you manage the number of staff needed in a particular span of the day. Nowadays, retail software is equipped with smart algorithms that can predict your future sales according to the figures your past sales report has defined. Inventory reports : Most software systems are equipped with inventory management systems, which allows you to see the real-time status of your stored stock. As a business owner, you must be aware of which inventory values and commodities you are lacking or low on. 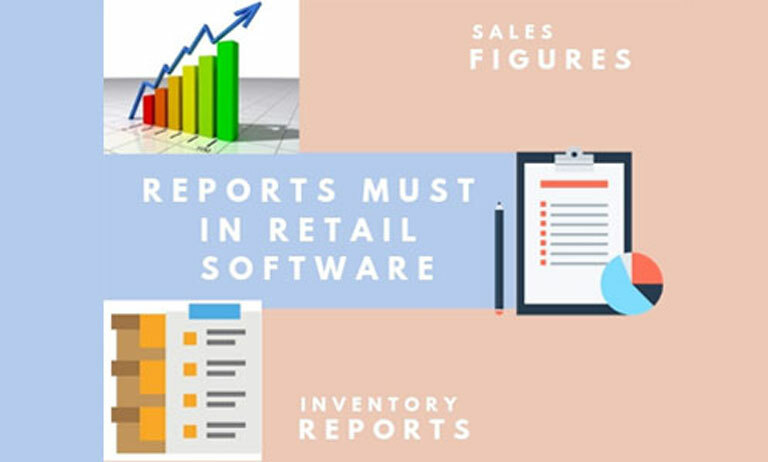 The retail software integrates inventory software with POS software, which provides you real-time reorder report, value report, tracking report etc. of your inventory. Customer reports : Customer's happiness is the ultimate goal of any business. POS software equipped with customer management solutions can monitor the tracking customers, making deals and marketing campaigns (like email or mobile marketing) and can even generate a customer loyalty program. This will help you build relations with individual customers without your intervention to anything. As an owner, you can look into total sales, top customers, their purchase histories and the employees can work on a customer database to plan offers to please the customer accordingly. Employee reports : Nowadays, a challenging task for any business owner is to determine the precise value of his biggest asset, his team of employees. Recent developments in POS software has led to employee specific report generation which includes a number of hours the employee worked, a shift he worked in, sales he managed, the profitability of employee and overrating to decide employee's worth for your business. Another report is payment reports which include the amount and mode of payment, tax evaluation, refunds, voided sales, discounts, profits, losses, credits, employee paychecks etc. Reports matter a lot when it comes to business development in this era. And the importance of each report will depend on the type of retailing business you have. Hence, you can choose companies like PAIT BIZ Pvt Ltd, who are known for their customized Retail software in Pune and also we do hardware AMC in Pune for your smooth IT operations. This will help you choose and suggest what you actually need instead of what you want or what others are doing. Going with the trend is good, but be wise before choosing plans for retail management.